What are life insurance policy riders? Term life insurance is an essential insurance option that protects your loved ones against financial hardship if something were to unexpectedly happen to you. In order to get the coverage that best fits your needs, you can add additional benefits to your policy (add-ons called riders) at the time of purchase. Life insurance riders supplement your term life policy with more coverage by offering additional protection from the potential loss of income due to terminal illness, disability, or other adverse life events. These policy add-ons are referred to as riders. Riders vary by insurance company and by policy, as do their costs. It’s also good to note that adding a rider to your term life insurance may increase your life insurance premiums, so make sure the extra coverage is worth the cost. A great feature of term life insurance is the ability to customize it for your particular situation and lifestyle with policy riders. Convertible term life insurance is simply a term life insurance policy with a term conversion rider added on. Because term conversion riders are so common and usually automatically included, these policies are just referred to as a convertible term policy. A term conversion rider allows you to convert your term life insurance policy to a permanent policy without having to go through underwriting or take another medical exam. A term policy may have been perfect for you when you were younger, but as you age, a permanent policy may fit your situation better. This rider is built into most life insurance policies and is extremely beneficial if you happen to run into health issues as you age. Having the ability to convert your term policy to a permanent policy could mean the difference between having a term policy that runs out or one that could be converted with a claim being paid. The disability income rider provides a waiver of premium and a supplementary income if you were to become disabled. The supplementary income is based typically on the face amount of your policy. Most insurance companies will place a limit on how much will be paid per month and on the length of time you will receive the benefit. This rider is very similar to a long-term disability insurance policy, but it can be conveniently added to your policy rather than you having to purchase it separately. A long-term care rider is similar to a long-term care insurance policy. Money is taken from your death benefit to pay for your care if you become chronically ill and are unable to take care of yourself. You can use this benefit if you have to stay at a nursing home or receive home care. With this rider, it’s important to keep in mind that the maximum benefit is typically only a percentage of the life insurance policy’s face amount and it is taken from your death benefit. A critical illness rider will provide a lump-sum benefit to help cover medical expenses and other costs if you were to be diagnosed with a critical health condition. This benefit is taken out of your death benefit and covers illnesses such as cancer, stroke, heart attack, coma, and others. Medical expenses can add up quickly with a critical illness and many people don’t have an emergency fund large enough to cover these expenses. This is why you may opt to add a critical illness rider. 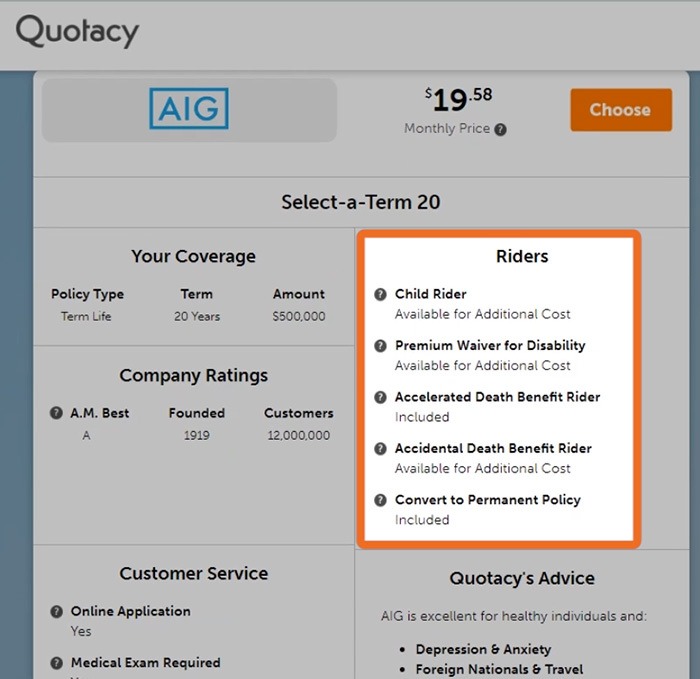 The accelerated death benefit rider pays a portion of the death benefit to you (the insured) if you become terminally ill with a short life expectancy. On most term life insurance policies, this rider is included automatically for free. 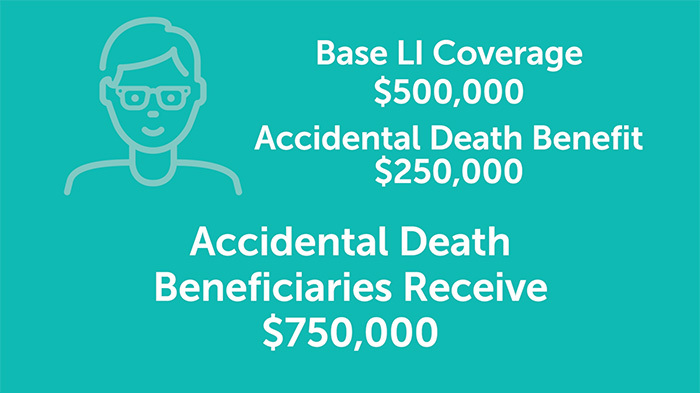 The policy states how much of the death benefit would be available before death and it’s usually capped at $250,000 to $500,000. A child rider provides coverage should the death of a child occur. While this tragedy would not result in loss of income, it could still bear financial hardship for a grieving family in regards to taking off work and funeral expenses. This rider would provide financial assistance during a difficult time. Once the child reaches the age of 25, the rider can be converted to an individual life insurance policy without an exam. For a special needs child, who might not otherwise be insurable, the child rider is an essential addition for a parent who is buying a term life insurance policy. If you have a special needs child, do speak with our agents so that they can help you get the most protection for your child at the time of purchase. When purchasing insurance, you may add virtually any form of term insurance to a base permanent policy in the form of a term rider. This option would be beneficial to policyowners who have a temporary need in addition to their long-term need. If added to the purchase of your term life insurance policy, the guaranteed insurability rider (called an additional purchase option) guarantees your policy’s renewability at the end of its term. If you decide to renew your policy, you will not be required to provide additional proof of insurability. This rider is useful if you want to purchase a permanent policy, but are unable to afford the premiums for large face amounts at that time or think you may need more coverage later in life. This rider gives you the option to purchase additional coverage in the future without evidence of insurability. A waiver of premium rider ensures that you would not need to pay the premiums on your life insurance policy should you become totally disabled and can’t work. For most insurance companies, the disability needs to last six months or more before benefits begin. Some companies will reimburse the payments made during the six-month waiting period. An unemployment protection rider ensures that you would not need to pay the premiums on your life insurance policy, if you would lose your job. You need to show proof that you have been receiving unemployment benefits for four continuous weeks before benefits begin. With most insurance companies, this rider expires when you turn 65 years old. The accidental death benefit rider (called a double indemnity rider) increases the death benefit, if you die as the result of an accident. Sometimes this rider also includes additional payment for dismemberment; you would collect money if you lost a limb or your sight. Be aware that life insurers do consider your occupation and hobbies when determining these premiums. With the return of premium rider, you pay higher life insurance premiums for the opportunity to get all of your money back if you live past the term on your life insurance policy. There are many factors to consider when shopping for life insurance. The amount and type of life insurance you need depends on factors such as income, your dependents, debt, lifestyle, and how much risk you are willing to take. We have covered here the most common types of life insurance riders, but this list is not exhaustive. If you’re interested in purchasing a life insurance rider with your term policy, start by running a term quote. Our quoting tool shows you all your life insurance company options, including the individual riders available. Life insurance riders are add-ons you can purchase with your life insurance policy that provides you extra benefits. Similar to how you can add an earthquake or sewer backup endorsement to your homeowner’s insurance policy. Most life insurance riders are only a couple extra dollars per month. Some are included free of charge. Let’s go over the five most common life insurance riders for our viewers. This rider allows you to change your term life insurance policy into a permanent life insurance policy without having to be re-evaluated or take another medical exam. A term conversion rider allows you to convert your term life insurance policy into a permanent life insurance policy without having to go through underwriting again. Because term conversion riders are so common and are usually automatically included for no charge the term policies that include these riders are just referred to as convertible term life insurance. Having convertible term life insurance is especially beneficial if you run into severe health issues as you age. For example, if you purchased a 30-year term policy and you’re diagnosed with cancer in the 10th year of your policy you can choose to convert it to a permanent policy and you wouldn’t be declined even though you now have cancer. This rider exempts you from having to pay for your life insurance policy’s premiums if you become disabled and are unable to work. If you purchase a waiver of premium rider with your life insurance policy, the insurance company won’t require you to pay your policy’s premiums if you were to become disabled. This rider comes with conditions. For example, most insurance companies won’t start waving premiums until the disability has lasted six months. And oftentimes the rider states that the disability has to occur before you turn 65. But during this period of total disability, your life insurance coverage remains inforce even as you’re not paying your premiums. And even if you recover from your disability, you don’t have to pay the premiums back. This rider allows you to access a portion of your policy’s death benefit if you become terminally ill.
An accelerated death benefit rider is normally automatically included on term life insurance policies free of charge. 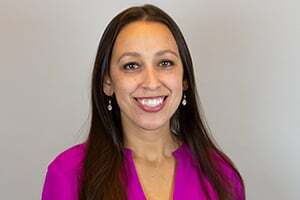 If you are diagnosed with a terminal illness, this rider allows you to have access to a portion of your policy’s death benefit to spend any way you wish. For example, let’s say you have a 30-year $500,000 term policy and you’re diagnosed with the rare illness in year 10. Your doctors tell you that you have less than a year to live but there are experimental treatments available that will prolong your life, however, your health insurance doesn’t cover these costs. You can accelerate some of your policy’s $500,000 death benefit to pay for the treatment. If you’re a Quotacy customer, you’d just tell your agent the situation and he or she will help you with the paperwork that the insurance company needs. After approval the insurance company sends you a check for the amount. The amount you claim will reduce the death benefit you leave behind to your beneficiaries in that amount. 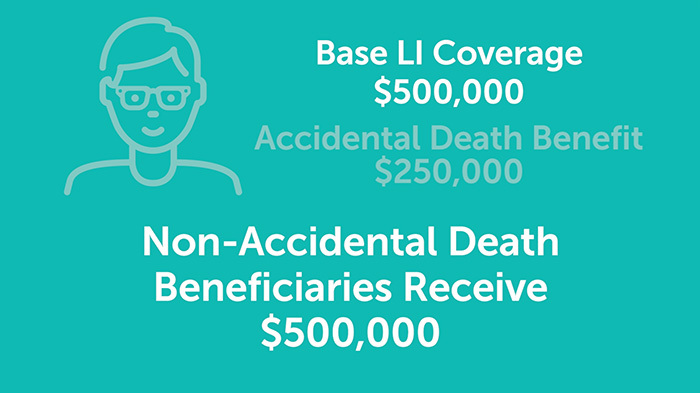 How much of your death benefit you can accelerate varies among life insurance companies. Some let you make a claim for the full amount and some only allow you to claim a certain percentage. A Child Rider can be added to a parent’s life insurance policy to provide coverage to all of their eligible children under 18 years of age. This coverage can later be converted to a standalone permanent life insurance policy for the child. A child rider can be purchased to provide life insurance coverage on all of your children under the age of 18. The cost of this rider is very minimal, usually around $50 a year for $10,000 in coverage. And this is $10,000 per child, not total. So whether you have just one child or ten children, the $50 provides $10,000 of insurance on each one. The worst thing in the world would be for your child to die before you, but if this happens, this rider can provide funds for the funeral and memorial services. Your children are likely to outlive you and once they are adults, you or your child have the option to convert this rider into a permanent policy for the child without having to go through underwriting. This rider increases the death benefit the beneficiary receives if the insured dies due to an accident. If you purchase an accidental death benefit rider with your policy, the insurance company will actually increase the death benefit that they pay to your beneficiaries if you die as a result of an accident. For example, if a policyowner has a $500,000 term life insurance policy with a $250,000 accidental death benefit rider and this person dies due to a heart attack, the beneficiaries receive $500,000. But if the person dies in a plane crash the beneficiaries receive $750,000. This rider is popular with those who have a dangerous occupation or participate in risky hobbies. And not all life insurance companies offer the same riders. 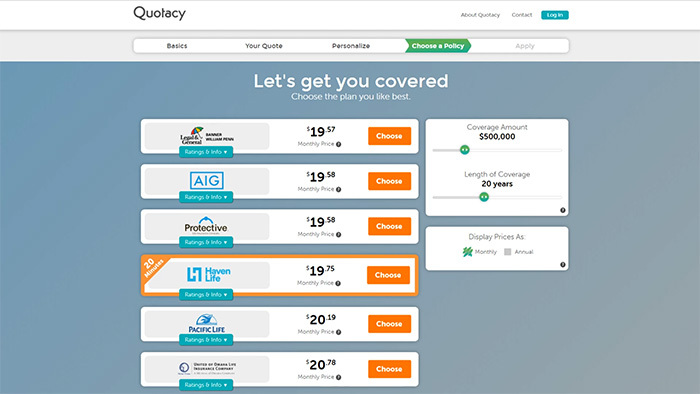 When you apply for life insurance through Quotacy, before you even choose to apply, you can see what riders are offered by our insurance companies. When running a quote, you’ll end up on this page where you choose which insurance company you’d like to apply to. Click the Ratings and Info tab under any company logo and an information box will drop down. On the right hand side you’ll see what riders are available through each of the different insurance companies. After you apply let your Quotacy agent know if you’re interested in adding any riders. He or she will let you know the exact cost and can add it to your policy during the buying process. Thanks for watching! If you have any questions about life insurance make sure to leave us a comment. Otherwise, tune in next week when we talk about what not to do when you name your policy’s beneficiaries. Bye!